Since first opening its doors in 1968, R.L. 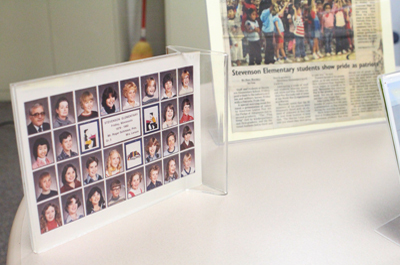 Stevenson Elementary School has benefited thousands of students and families in the community for 50 years. This anniversary serves as an opportunity to look ahead to the future, as well as recognize the legacy of excellence that has been created. 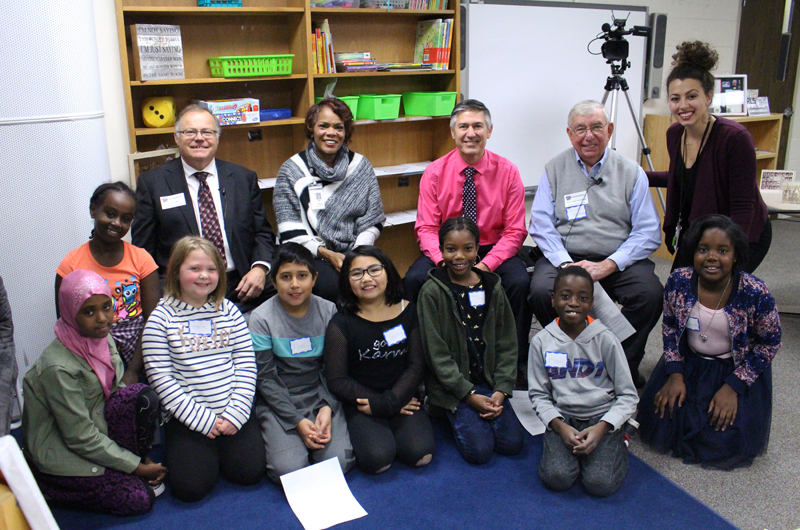 To honor the past, present and future, Stevenson students interviewed four special guests: Stevenson’s very first principal Gerry Mackleberg; current Stevenson principal Daryl Vossler; Superintendent Dr. Kim Hiel; and Fridley Mayor Scott Lund. 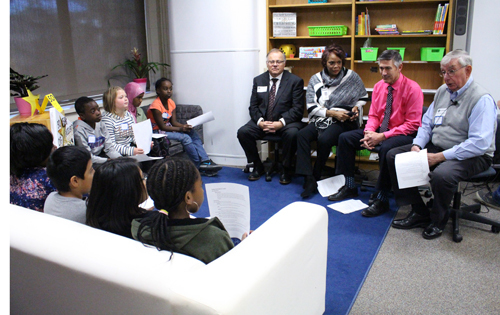 With the help of Family and Cultural Liaison Hope Laroche, eight 4th grade students presented thoughtful questions to the special guests about Stevenson’s legacy of education in the community. Students who participated were: Marie-Victoire Kolibe-Gnamikou, Janitzia Pineda-Chavez, Alan Rodriguez Hernandez, LaNasia Ferguson, Ryan Takyi, Merin Jacobs, Marwo Jibril and Gabriella Bekele. 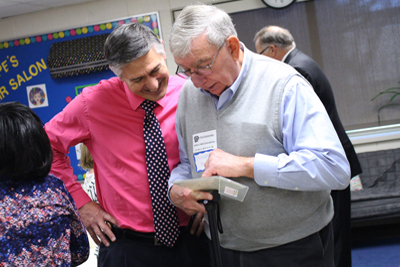 The students were excited to know that while Mackleberg was principal at Stevenson Elementary, their current principal Vossler, was one of his young students. 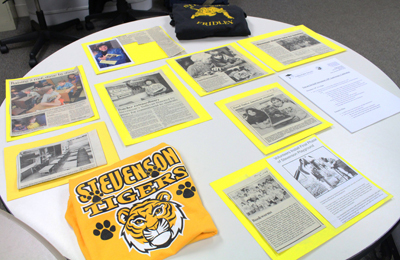 Mackleberg, who retired 23 years ago, shared stories about the beginning of Stevenson. Ryan asked Vossler what Stevenson is most proud of as a school. Marwo asked Dr. Hiel about her vision for Stevenson in the next 50 years. “What is Stevenson striving to be for its students, families and community as we look forward?” Marwo asked. “In the next 50 years, at Stevenson and all the schools in our district, we are striving to teach our students how to think, and not what to think. We want to prepare you for whatever comes your way and always keep on top of what is the best way to learn,” said Dr. Hiel. 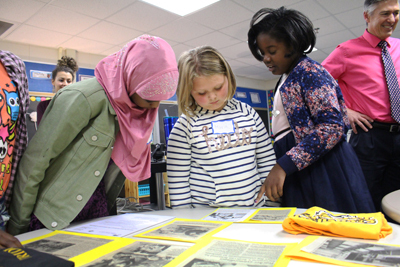 Stevenson Elementary will be hosting a special Integrity Celebration on December 14, 2018 to celebrate its 50 years of excellence. Mackleberg, as well as many retired Stevenson staff members, will be joining the celebration to honor the legacy of the school.